Swing Dance Is Described As “AfroDancehallBeats” Produced By Triple O Productions Who Produced CapitalXtra/KissFM/BBC 1XTRA/4MUSIC Playlisted “Bubugaga”. Beenie Man Who Is Known As The “King of DanceHall” has done all Genre’s of Music Including Afrobeat. His First Collaboration was with Afrobeat Superstar Tuface Idibia From Nigeria And Reggie Rockstone From Ghana For the Song Nfana Ibaga. 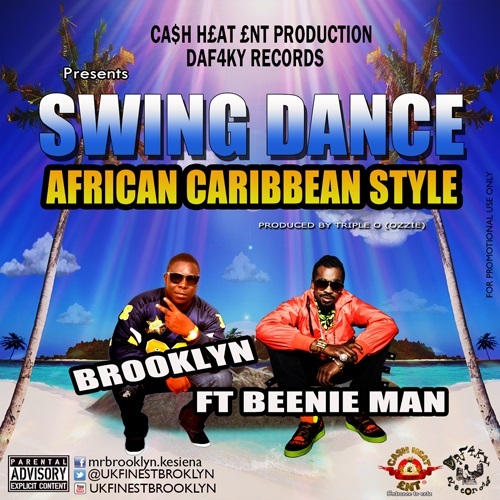 The Opportunity was Presented For Him To Record “Swing Dance” Featuring “Brooklyn” Who Is The First Signing to CashHeat Entertainment/Daf4ky Records, Laying Down the Concept with Nigerian Street Slangs. Beenie Man Recently Performed At the BET Awards To a WorldWide Applause Which Has Presented Him With a Worldwide Tour. In the Middle of His Busy Schedule He Blessed “Swing Dance” With His DanceHall Signature Vocal Performance.